No battle plan survives first contact with the enemy and it’s why the first round of the NHL playoffs typically ends with major upsets every year. The majority of pundits beyond Montreal, and some within expect a short, one-sided affair with the Boston Bruins moving on in 5 or 6 games, even though the Canadiens won the season series 4-2 and were only outscored by two goals. The Boston Bruins come into the playoffs ranked 3rd in the league generating even strength offense while the Canadiens are the worst of all playoff-bound teams, scoring 32 fewer goals and finishing the regular season ranked 26th in the NHL. Ominous indeed when you consider two-thirds of an average NHL game is played at even strength. The Habs did win the season series 4-2 but save for that first meeting on November 11th in Boston, it’s been a matchup where home ice advantage and having last change has been the difference maker. With the Canadiens opening in Boston, one cannot ignore the fact the Habs have been outscored 13-3 at even strength and 5-1 from the front of the net. While the Habs have been outscored in Boston, it hasn’t been for lack of prime opportunities at even strength, being outshot just 20-19 in front of the net. Zone 1, the net area extending out to the hash marks between the circles is where the majority of all goals are scored and solid offensive teams score from there almost 20% of the time. The Habs are -9 in goal differential on the road and have limited opponents to 17.7% efficiency on the year. In their season series, the Bruins have scored on 20% of their Zone 1 shots while the Canadiens have only converted on 5% of theirs, pathetically well short of their already poor 12.7% shooting percentage in front of the net when on the road. In my story on why the Habs struggle to score, I demonstrated how home teams were much more effective forcing the Canadiens to score from further out, towards the perimeter when they had the benefit of last change and could get the matchups they wanted. Home teams have succeeded far better than in Montreal where Carey Price has said numerous times boxing out the opposition made life easy. For the Habs to win the series, their forwards must be willing to pay the price on the road and drive to the net. The Bruins have gotten their matchups and have done an excellent job denying time and space in front of Tim Thomas. Needless to say, it’ll be a short series if the Canadiens can’t find a suitable replacement for Max Pacioretty’s net presence and bury more than 5% of their Zone 1 shots. Andrei Kostitsyn has been the only other big minute forward who’s demonstrated a willingness to pay the price with the size to maintain a screen in front of Thomas. All eyes will be on Mathieu Darche to see if he can handle more than 11 minutes a night and replace Pacioretty’s net presence but even if he can, someone else will need to step up. I have little confidence that’ll be Benoit Pouliot or Scott Gomez so Lars Eller, Travis Moen or Ryan White will likely have an opportunity to become a playoff hero. How the teams match up at even strength in Montreal is quite different however. 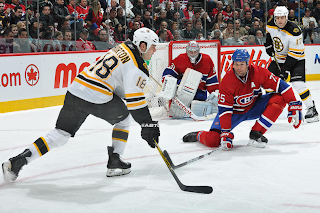 The Canadiens have outscored the Bruins 8-5 and outshot them 15-13 in Zone 1. With last change, the Habs were able to convert on 31.8% of those prime shots, outscoring the Bruins 7-3 in Zone 1 while the Bruins converted on 18.8% of theirs. Further evidence that line matching from home ice advantage has had a considerable impact on the season series. That said, it’s simply unrealistic to expect the Habs to continue scoring on more than 30% of those prime shots so they’ll need to generate more close-in chances at home as well. Scott Gomez hasn’t scored in 29 games and just once in 40 so the Habs weak offense will be stressed even more if Jacques Martin asks Plekanec play a shutdown role against Boston. That said, Cammalleri, Kostitsyn and Gionta all saved their best offensive production for the last quarter of the season so if Darche can step up and get some help rattling Thomas, there’s a chance to win the series. The X-factor among the top 6 forwards is the “Give a damn” quotient of Scott Gomez. He needs to contribute offensively and avoid retaliatory penalties but Gomez has given little indication he’s interested. Unfortunately, the Canadiens won’t go far if he continues to rely on teammates, making a fraction of his paycheque, to carry his bags so the time is now for Gomez. As for secondary scoring, can the group of Desharnais, Moen, Eller, Pouliot, White and Pyatt contribute against Boston? Halpern may be able to play later in the series but to open up, that group of 6 scored just 12 goals the last quarter of the season in a combined 114 games. Not good enough. Benoit Pouliot hasn’t scored in 24 so the bottom 6 must find a way to generate offense while inciting the Bruins into bad penalties. Safe to say, Ryan White should get ample opportunity to do just that but the bottom six must, at the very least, avoid being a liability at even strength. Discipline. Discipline. Discipline. Time is running out on the Canadiens to get control of it. A systemic problem that took Jacques Lemaire all of two weeks to address in New Jersey has been tolerated by Jacques Martin and the coaching staff all season. There's simply no excuse for it and it must stop immediately. Piss-poor team discipline has not only cut far too many power plays short, it’s resulted in handing the opposition 35 more power plays this season; 9 more at home, 26 more on the road. The Habs also led the league in bench minors with 14 so if they want a shot at beating the Bruins in a seven game series, discipline starts now against a team that took 80 fewer minor penalties. Head-to-head, the Canadiens power play went 9 for 27 against Boston this season. Over 6 games in the regular season the Habs scored a total of 20 goals so if they continue to struggle at even strength, they will live or die on special teams. During the playoffs when power plays are hard-pressed to score more than 15% of the time, an over-dependence on special teams to make up the difference may end up being very costly indeed. During last year’s playoffs, fighting dropped about 77% which is expected when games matter more but the result was more, not fewer minor penalties being called. Common perception is that fewer penalties are called in the playoffs but if last year is any indication, we can expect to see about .70 more minors called per game on average, translating to about 5 penalties each night and an additional 5 power plays up for grabs over a seven game series. Small numbers that can ultimately decide a series. Historically, the Montreal Canadiens have played far more disciplined hockey when facing the Bruins in the playoffs and it’s been a major factor in eliminating Boston over the years. The Habs utter lack of discipline has turned that historic advantage upside down so unless that season-long struggle stops dead, it’s questionable if they’ll have enough power plays to off-set the lack of production at even strength. Boston on the other hand went 3 for 24 on the power play and scored 22 goals in total during the season series so while just 2 goals separate the two teams, how they got them are diametrically opposed. If the Habs can change their spots and impose team discipline while inciting the Bruins into taking bad penalties they’ll have a chance but if Boston plays physical yet disciplined hockey, it could be a very short series indeed. For the Habs, it’s all about crease protection. The addition of Mara and Sopel, combined with Hal Gill and the return of Jaroslav Spacek upgrades their shot-blocking considerably while P.K. Subban, James Wisniewski and Roman Hamrlik need to be in top form for the transition game to keep the Bruins on their heels. Subban cannot be suckered into taking penalties, even coincidental minors so how the rookie responds in the pressure cooker will be key. Mobility on the back-end is a concern overall but that shouldn’t be a major factor against Boston. If the defense can move bodies from the crease area and clear rebounds, Carey Price has proven he’ll eat up shots from mid to long range. If the Canadiens lack of finish in front of Tim Thomas is any indication, the Bruins have done an excellent job protecting their goalie from facing numerous rebound opportunities while forcing teams to try and get their goals from the perimeter. Pretty numbers aside, in a playoff atmosphere I believe Carey Price is more prepared to deal with people in his kitchen than Tim Thomas, someone with a well-earned reputation for getting emotional with people buzzing his crease. Thomas has also struggled in Montreal since the 2008-09 season so if the Habs can get a split in Boston, there’s a legitimate chance the Bell Centre crowd could rattle him. It’ll come down to whether or not the Canadiens forwards are willing to pay the price often enough to create that environment. Claude Julien can be combative and make emotional decisions out of bravado, which if the right buttons are pushed, can undermine the larger goal of winning a playoff series. Jacques Martin on the other hand is too calm and tends to freeze when it’s obvious the game plan isn’t working. Strategic time-outs, before things get out of hand and adjusting on the fly is in no way his strong suit. Both coaches create solid game plans but the series will be decided by how each adjust as the battle unfolds and who loses their composure first. Martin and Pearn need to be better at getting the matchups they want on the road and make changes on the fly without taking foolish bench minors as they’ve done all season. Can the Habs strength on the power play off-set the advantage the Bruins have at even strength and can either team turn weakness into strength? The matchup is much closer than what the last two games in Boston would have many believe and the offensive difference is just two goals, spanning six games. The goaltending is pretty equal so scoring will primarily come from goalmouth scrambles and screens. The greatest concern for the Habs is mental. The opportunity for a push-back game in Boston on March 24th was a disaster from start to finish. It was simply embarrassing to watch, as was the 8-6 beat-down loss back on February 9th. Do the Canadiens have the intestinal fortitude to play a controlled game in Boston and win at least one game in four? They’ve proven they can win in their barn while the Bruins are winless at the Bell Centre this season. Seeing the paranoia among members of the Boston media and their fans over refereeing when the series shifts to Montreal suggests a certain fragility still exists from playoffs past. Even though the Canadiens have taken 9 more penalties than their opposition on home ice this season, there is a palatable undercurrent of baseless concern that the Refs will somehow screw them. How the Habs handle adversity in Boston this time will dictate the outcome. If it’s more of the same, the series could be over in 5 or 6 but if they can play disciplined hockey, demonstrate team toughness and show intestinal fortitude in game one, they’ll push the Bruins to the limit. Habs in seven.